In this brief series called Consequences, we are looking together at 7 consequences of Jesus’ death and resurrection. Today we continue to look a bit deeper into that God-man, Jesus Christ and in particular His relevancy today in regards to suffering. Ever since the first time humanity sinned against God, there has been death and suffering. Suffering was not part of God’s original creation and only came in after this event. God had a plan to alleviate this. As part of this plan, throughout his ministry Jesus said that he would suffer, die and be raised back to life again. Jesus went about alleviating the suffering of people – whether from physical, mental or spiritual suffering. Quite possibly the biggest question we ask ourselves, or is asked of us by others, concerns the problem of suffering. I will start out by saying I don’t have all the answers, but I do know that I have suffered and still suffer today. I have died twice and been resuscitated twice. I also know that it was humanity’s sin which was and is the creator of all kinds of suffering, not God, as critics of the church maintain. I also know that Jesus the Son of God suffered. Indeed Jesus the Son of God died. Therefore God Himself knows what it is like to suffer. We know that God is personal and we know that as Jesus was both fully God and fully human, that God has suffered. God who is without sin became sin, when Jesus the Son of God died on the cross. Through the life of Jesus Christ and His cross and resurrection, we see that the Almighty and Eternal God entered the time and space of His creation, even though He Himself is outside of time and space. God intimately knows what suffering is like, because of the suffering Jesus endured. Sufferings such as when he wept at the death of Lazarus his friend. Suffering such as before He was arrested, Jesus suffered such anxiety that he perspired blood (Luke 22:44). On his way to crucifixion, Jesus was beaten and whipped so badly that He was disfigured and malformed, God suffered. When He was nailed to the cross, God suffered. When on the cross, and endured the insults hurled at him – God suffered. Jesus died on the cross, and for the first time in eternity, Jesus the Son of God was separated from God the Father. WOW! That is suffering. That is why we have a hope. The God who calls us into relationship with Himself knows intimately what suffering is like. He endured all kinds of suffering just like us. That is why we know God is a personal God. An implacable statue is not personal and cannot have sympathy with us in our sufferings, but the living God can – because the living God died! But Jesus’ death on the cross was not the end! Three days later Jesus was resurrected in the power of the Father! Jesus death and resurrection show that sin, suffering and death have been conquered! When the Holy Spirit comes and lives within, one of His main roles is as the great Comforter who provides comfort and consolation during the times when we suffer. I don’t know how you are suffering today. I do know that I suffer every day in some way. I have died twice in the past and been resuscitated. You may be suffering in someway and I wish I could take it from you, but I am unable to. And this may sound glib, but I know that because God suffered when He died on the cross, God is with you and knows intimately what suffering is like. But there is one thing I do know and hold onto. This Jesus is coming back again, this time as the Almighty King of Glory! One glorious day every kind of suffering will be banished for those of us who love Him. What a glorious day it will be for those of us who love Him now. God Himself, with our face in His hands, wiping away our tears… When our King returns, there will be no more terrorism, missiles, guns, wars or bombs. No more will man’s inhumanity to man be allowed. No more torture, rapes, muggings or robberies. No more poverty or famine. No more religion, idols or icons. No more gossip, fornication, adultery, lying or debauchery. No more cowardice. No more pain. No more death. No more suffering. No more sin. Jesus wiping the tears of sorrw and joy from our eyes as He takes our head in his hands… WOW! Have you asked this Jesus to be your Saviour and King yet? Jesus – the God-man who conquered sin, suffering and death who died and was raised to new life again by God. When you allow Jesus to be your Saviour and rely on him for your salvation, you become spiritually alive! Until then, you are spiritually dead. But you can have spiritual life! Come and follow this personal and personable God who knows what suffering is about. What are you waiting for? Again, I ask, who do you say the Jesus is? you have a choice to make. Deny Jesus know and he will deny you. Accept Jesus now and He will accept you. It is not too late! Today can be the day of your salvation and new life! In this brief series called Consequences, we are looking together at 7 consequences of Jesus’ death and resurrection. Today we continue to look a bit deeper into that God-man, Jesus Christ! We see through the Cross and Resurrection of Jesus Christ that God himself has taken on the responsibility for our sins. Jesus, the Son of God, bore our sins on the cross, became sin for us, even though he was without sin. By doing this we are drawn to God in a personal way through Jesus Christ. God has shown that he loves us and wants us in a relationship with himself. Through Jesus, God has bridged the gap between the supernatural and the natural, the infinite and the finite, to show us what He is like. Jesus as God in person gives humanity a focal point to respond to. esus, the Son of God, became human so as to destroy all the works of satan (1 John 3v8, Hebrews 2v14), to give humanity an example of living a holy life (1 Peter 2v21, 1 John 1v6) and to prepare for the redemption of all creation (1 John 2v2)! WOW! This Jesus was both fully God and fully human. This unity of divine and human nature is called ‘hypostatic union‘. Let us look briefly at this Jesus! Jesus was fully human! We know this because He is explicitly called a man (John 8v40; 1 Timothy 2v5), was born of a woman (Galatians 4v4), so at least in a prenatal state he was nurtured and formed as any other male baby was and is. Jesus exhibited normal human emotions such as love, sorrow, anger and anguish. Jesus wept tears of sorrow. Jesus ate and drank as any normal human did and He had a body and a soul (Matthew 26v26-38). He had normal human experiences – tiredness, sleeping, perspiration, temptations (Hebrews 2v18); hunger (Matthew 4v12). Jesus died just as all people do. Jesus was human in every way that we are - physically, mentally and emotionally. The only exception to this is that He was sinless (2 Corinthians 5v21; Hebrews 2v26). He was the Son of Man and Son of God and did not inherit the carnal nature that all humans have. But why does Jesus need to be fully human? Firstly, so Jesus death could appease God’s anger with us. Secondly, so that Jesus can empathize and pray for us in our own sufferings. Thirdly, Jesus exhibited true and perfect humanity and therefore is an example to follow. Fifthly, while God is both above and beyond creation, by becoming human, this shows that He is not so far removed from us, that He cannot interact with his creation. Not only was Jesus fully human but He was simultaneously fully God! He is expressly called God - (John 1v1) The Word was God; (John 1v14), the only begotten God (John 20v28) and He accepted titles from others such as when the Apostle Thomas exclaimed “My Lord and my God”. Additionally Old Testament descriptions of God were applied to Jesus. (Matthew 3v3) 'Prepare ye the way of Jehovah!’ Jesus possessed the attributes of God - (John 14v6) Life; (John 8v58) Eternal; (John 14v6) Truth! The works of God are ascribed to Jesus - (Col 1v16) and Jesus receives honour worship and glory belonging to God alone.Jesus had equality with God - (John 10v30, 33) I and the Father are One; John 5v18)! Jesus in His very nature was God; (1 Timothy 6v15) and King of Kings and Lord of Lords! Jesus was and is the Alpha and Omega! Jesus was the Christ; (John 8v58) and much to the chagrin of the Jewish religious leaders declared frequently that He was the great “I AM”, an explicit claim to be God! Jesus - fully God and fully human - the object of our faith! Tomorrow we look even closer at this man and in one particular aspect of his relevancy today - our suffering - in the next of our series, “Consequences”! See you soon at Partakers! 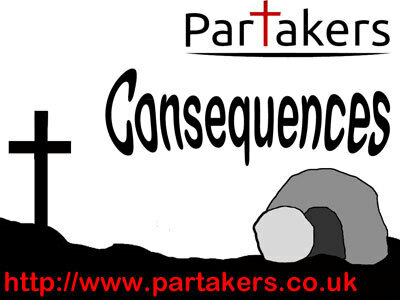 In this brief series called Consequences, we are looking together at 7 consequences of Jesus’ death and resurrection. Today we continue to look at the message of the early church regarding this Jesus – a message which is also relevant to us today! Yesterday we looked at the Cross and today we will look at the Resurrection. 1 Corinthians 15:12-14 But if it is preached that Christ has been raised from the dead, how can some of you say that there is no resurrection of the dead? If there is no resurrection of the dead, then not even Christ has been raised. And if Christ has not been raised, our preaching is useless and so is your faith. That was the Apostle Paul, writing to the Corinthian church about the crucified Jesus having been physically raised from the dead! What significance is there in Jesus’ resurrection, that the early church afforded such great value in it as part of their message? The resurrection of Jesus Christ provided the central theme for the sermons and teaching in the early church (Acts 1:22; Acts 4:33, Acts 17:18). Certainly within Paul-ine theology, but what significance is there in Jesus’ resurrection? The resurrection proved and vindicated all of Jesus’ teaching and claims as the suffering Servant and attested to His being fully God, fully human and the last Judge of all mankind (Isaiah 53:10-12; Acts 2:36; Acts 3:13-15; Romans 1:4). The resurrection, declared God’s approval of Jesus’ obedient service and the fulfilment of Old Testament promises as well as Jesus’ own words about it! The cross and resurrection of Jesus results in forgiveness of sins and salvation being only found in and through Jesus Christ. This was the prime motive for evangelism in the early church (Acts 2:32, Romans 4:24-25). Jesus’ resurrection is a sign of the bodily resurrection for all believers in Him, giving a new attitude to death and transforming hopes (1 Corinthians 15:12-58, Romans 8:10, 2 Corinthians 4:14; 1 Peter 1:3 & 21). As the resurrected King, Jesus now intercedes for us and has perfected the redemption of all those who choose to follow Him (Romans 5:10; Hebrews 6:20, 1 Peter 1:21). Finally the Cross and resurrection ensure victory over satan, sin and death – they are conquered and squashed. Satan is a defeated creature and will do anything to drag people into defeat with him. The power of sin is conquered, and sin’s grip is overcome if you are a believer in Jesus Christ. Finally, as I said earlier, death has been beaten, because those who believe and trust in Jesus Christ will live forever with him – death is not the end but a beginning. if Jesus Christ did not physically rise from the dead, we as Christians are the product of the greatest delusional lie and are the most foolish of all people. Those who are, or were, non-believers will also be resurrected (John 5:28-29), but will not have the new glorious bodies of believers, nor will they enter into heaven. It makes the work of evangelism for all Christians, all the more imperative. Ultimately Jesus gives all humanity a choice. You can choose to deny the cross and resurrection of Jesus Christ and say it doesn’t matter. You can say that it is an irrelevance and that is your right. God’s love is compelling and amazing but He does not force anyone to love Him in return, because love never forces! Such is the enormity of the love of God that each person has a choice to make – follow Jesus and accept His cross and resurrection or not to do that. God will not force you to accept it, but he will keep on calling you back to the cross and resurrection of Jesus. Jesus death on the cross and His resurrection was the central message of the early church! That is also to be our message as church in the 21st century! Tomorrow we look even closer at the man central to this extraordinary message in the next of our series, “Consequences”! See you soon at Partakers! In this brief series called Consequences, we are looking together at 7 consequences of Jesus’ death and resurrection. Today we start to look at the message of the early church regarding this Jesus – a message which is also relevant to us today! This message is the Easter story – Jesus’ death and resurrection! However, the ultimate solution to sin was not the continual animal sacrifice of the Old Testament because the blood of animals was unable take away sin because they were only a veneer. That was why it was necessary to repeat time and time again! But those animal sacrifices pointed forward to a time when they would no longer be necessary! They pointed forward to the time when only through the Christ’s death on the cross, that sin would be taken away (Hebrews 9:11-15, 26-28) and not merely covered or coated! What has this to do with Jesus? We see in the Gospels how Jesus Christ was tempted and taunted by satan to disobey God to the extent of not going to his death on the cross. If Jesus had ever succumbed to temptation, and sinned against God in thought, word, action or inaction, then He Himself would have needed a Saviour. That is why Jesus is the perfect sacrifice – because he never sinned and he always did what He saw God the Father wanting Him to do. Because of the cross and resurrection alone, satan, death and sin have all lost their sting and have been vanquished. WOW! The Cross is a choice! And there is yet more to the cross and resurrection of Jesus Christ! All human beings, in their natural state, are born sinners and have rebelled against God (Romans 3:23). However, because of Jesus’ death on the cross, God offers forgiveness (Ephesians 1:7), Peace (Romans 5:1) and reconciliation (2 Corinthians 5:19). Through the cross, humanity can choose to be made just before God (Romans 3:24-26) as it cleanses from sin (1 John 1:7) and makes humanity right before Almighty God (2 Corinthians 5:21). Because of the Cross, we can choose to have direct access to God (Ephesians 2:18) and Jesus Christ intercedes for us (Hebrews 2:17-18). Because of Jesus Christ’s death on the cross, all those who choose to follow Him have freedom from slavery to sin (Galatians 5:1) and freedom from the power of the devil (Hebrews 2:14). None of the above things are true if you are not a follower of Jesus Christ. Ultimately the Cross brings you to a choice. You can accept the cross and therefore be guaranteed peace with God. The cross of Jesus Christ epitomises God’s glory. Jesus Christ, as the Son of God who was simultaneously fully God and fully human, died on a cross, taking on Himself the sins of the world, paying the greatest price, so that you can be restored into a peaceful relationship with God the Father. That is for all people, of all nations, ages, generations, statuses and gender. There is a price to pay for those seeking to be followers of Jesus Christ! They must surrender completely to Him, be prepared to identify with Him in suffering and death and be willing to follow Him obediently, wherever He leads. Jesus death on the cross was preached by the early church! That is also to be our message as church in the 21st century, but that was only part of their message! The second part of the message we will look at in the next of our series, “Consequences”! See you soon at Partakers! Jesus has ascended back to the right hand of God the Father and the Holy Spirit has come upon and in the disciples! We go back to before those events now, to Matthew 28, to see the prelude for the next consequence of this series. What will the disciples do now that Jesus has gone and the Spirit has come? They will do as Jesus commanded – go and tell the world about this Jesus and teach them to be His disciples! One of the major themes of Matthew’s Gospel is the authority of Jesus. Matthew highlights Jesus’ authority in action and not just merely in words. For example, Matthew records Jesus’ authority to forgive sins (Matthew 9:6) and Jesus imparted authority to His disciples for a short time when they went on a mission in Matthew 10. Jesus has all the authority in heaven and on earth (Matthew 28v18)! Jesus has authority over all things and all people. Jesus has authority over all spiritual beings, whether angels or demons, as well as over all nations, governments, rulers, and over all earthly and spiritual authorities. One of the consequences of Easter is that Jesus’ authority is passed to His disciples. The disciples could be obedient to God without fear of retribution from those who would seek to harm them, regardless of the circumstances they would find themselves in. That is why they were so bold and why the church spread quickly! That was the work of the Holy Spirit who changed them from living in fear to living out their faith boldly! They had great confidence in their God, knowing that through His death and resurrection, Jesus had conquered all enemies. Christianity is a faith whereby all Christian Disciples are to tell others of the goodness of God and what Jesus has done for them. Indeed God Himself is a missionary God. Ever since Genesis 3 and the fall of man, God has been on a mission to bring and call people back to Himself. That was the purpose of the nation of Israel, to be a light to all nations of the goodness and glory of God! That was purpose when God, who is outside of time and space, entered human history taking on human flesh and restricted Himself in a human body as the man we know as Jesus Christ. Jesus whole mission was one of calling people back to life in God. As followers of Jesus Christ, all Christian Disciples are to showing and tell others of God’s message of reconciliation to all people of all time. It is not forcing people to adopt Church standards (1 Corinthians 5:12) and nor is it simply a message of join the church as a symbol of good works (Ephesians 2:8-10). The prime motivation for evangelism is out of gratitude for what God has done, in that we love because He loved us first. We are not all called to be evangelists but we are all called to make disciples of Jesus Christ! Making disciples is not just evangelism but ensuring that guidance and care is given to new disciples of Jesus Christ. How is this achieved? How can the Christian Disciple exhibit Jesus’ authority and power in evangelism? Who gives the impetus for Christian Disciples? That is part of the role of the Holy Spirit, whom Jesus said would come once He had ascended back to the right hand of God the Father. After all, as a Christian, you also have the same Holy Spirit within you as Jesus’ disciples did! WOW! Lets go make disciples to the praise of God the Father, with the authority of Jesus the Son of God in the power of the Holy Spirit of God. Our consequence tomorrow will be about the message we are to go with! ~Acts 2:1-4 When the day of Pentecost had come, the disciples were all together in one place. 2 And suddenly from heaven there came a sound like the rush of a violent wind, and it filled the entire house where they were sitting. 3 Divided tongues, as of fire, appeared among them, and a tongue rested on each of them. 4 All of them were filled with the Holy Spirit and began to speak in other languages, as the Spirit gave them ability. As we saw last time, Jesus has ascended back to the right hand of the Father. The 12 apostles are now back in Jerusalem and waiting. Waiting for the Holy Spirit to come and baptize, fill, empower, indwell and transform. Before Jesus went to the cross, He told his disciples a number of times that He was going back to the Father, that He would not leave them alone and powerless because the Comforter, the Holy Spirit, would be sent. The Holy Spirit would live in, empower and motivate the disciples. He would also remind them of all Jesus had taught them. Throughout the Book of Acts and in the other New Testament writings we discover more about the Holy Spirit. We see that His prime role is to see Jesus Christ the Son of God praised and glorified (John 16:13-14) by testifying for Jesus Christ (John 15:26) and witnessing for Him (Acts 1:8). The Holy Spirit is involved with ministering to members of the church. The Holy Spirit declares God’s Word, interpreting and illuminating it. He convicts of sin, transforms, indwells, fills, baptizes and seals the believer. With all this, the Holy Spirit also equips for service. God is at work in His body the church, to will and to act accordingly to his purpose (Phil. 2:13), to be my witnesses (Acts 1:8). Let’s look at the Holy Spirit at work, concentrating on His work in the life of Peter! Remember how Peter had rejected Jesus Christ and openly defied Him by trying to stop Jesus going to the cross. That Peter was a dejected and defeated man. There is now a new Peter! A new Peter, transformed by the Holy Spirit! A Peter who speaks with the authority Jesus gave all the disciples. This Peter, given impetus by the Holy Spirit, preaches a sermon and 3000 people are added to the church in one day (Acts 2:41). This Peter, who when passing by a man who couldn’t walk, told him to get up and walk – and the man did (Acts 3:1-11)! Peter was allowing himself to be guided and controlled by the Holy Spirit. The difference between this Peter and the dejected Peter before Jesus’ resurrection is due only to the Holy Spirit making a difference to Peter. Peter, by submitting himself to the authority and power of the Holy Spirit, was allowing the Holy Spirit to control him and guide him. The greatest evidence of the Holy Spirit living inside any of us, is the transformation of the individual into the image of Jesus – as demonstrated here in Peter. This Peter who under the influence of Holy Spirit’s power, administered church discipline as in the case of Ananias and Sapphira (Acts 5:10). But it wasn’t just Peter who was empowered. As Acts 5:12-16 shows us, all the disciples, not just the twelve apostles, were able to do all manner of things for the glory of Jesus Christ because they were baptized and controlled by the Holy Spirit. The Holy Spirit empowers and delivers the disciples passion for making Jesus Christ known. The early church was dynamic and seen to be exercising the authority of Jesus Christ. This was done by preaching the good news about Jesus being the long waited for Messiah. The Disciples exercised Jesus’ authority by submitting themselves to and relying upon the Holy Spirit. Would that be for the church of the 21st century! The Holy Spirit, lives inside and empowering all believers for the service and glory of Jesus Christ! Not just the 12 apostles for the service of Jesus Christ. Next time in this series Consequences we will look at where the early disciples were told to go and teach! Jesus has been raised from the dead! What happened next! In this brief series called Consequences, we shall look together at 7 consequences of Jesus’ death and resurrection and some of the theological implications. Acts 1:1-12 In my first book, Theophilus, I wrote about what Jesus began to do and teach. This included everything from the beginning of his life until the day he was taken to heaven. Before he was taken to heaven, he gave instructions through the Holy Spirit to the apostles, whom he had chosen. After his death Jesus showed the apostles a lot of convincing evidence that he was alive. For days he appeared to them and talked with them about the kingdom of God. Once, while he was meeting with them, he ordered them not to leave Jerusalem but to wait there for what the Father had promised. Jesus said to them, “I’ve told you what the Father promises: John baptized with water, but in a few days you will be baptized with the Holy Spirit.” So when the apostles came together, they asked him, “Lord, is this the time when you’re going to restore the kingdom to Israel?” Jesus told them, “You don’t need to know about times or periods that the Father has determined by his own authority. But you will receive power when the Holy Spirit comes to you. Then you will be my witnesses to testify about me in Jerusalem, throughout Judea and Samaria, and to the ends of the earth.” After he had said this, he was taken to heaven. A cloud hid him so that they could no longer see him. They were staring into the sky as he departed. Suddenly, two men in white clothes stood near them. They asked, “Why are you men from Galilee standing here looking at the sky? Jesus, who was taken from you to heaven, will come back in the same way that you saw him go to heaven.” Then they returned to Jerusalem from the mountain called the Mount of Olives. It is near Jerusalem, about half a mile away. Jesus’ resurrection is the catalyst for the mission of the church, beginning with the disciples and throughout history. Indeed, the growth and spread of the church, is a proof of the historical fact of Jesus’ physical resurrection or rising from the dead. Having been raised from the dead, Jesus’ mission to earth is coming to an end and shortly He will be returning to the right hand of the Father. Just as He had said to his disciples a few times before He went to the cross. Before He does leave though, He has some final instructions for His disciples. In the Gospel of Mark 16:14-19, the Gospel of Luke 24:50-51 and in our reading from the book of Acts 1:1-12, we read about Jesus physically ascending into the heavens. Jesus has returned to the right hand of the Father, as He said he would do before His death on the cross. During their last discussion with Jesus, the disciples were still expecting him to lead a revolution against the Romans (Acts 1:6). Despite all Jesus had said to them in the previous 3 years, they still did not understand that Jesus had come to lead a spiritual kingdom and not a political kingdom. Now it would be easy to think that Jesus has abandoned them, but no! Jesus tells them to go back to Jerusalem, wait for the Holy Spirit and then go tell others the Good News about Him! He had told them previously that he was going away and that it was better for them if He did, because the Holy Spirit would be sent to be with them, to live in them and empower them for the work they had to do! And even after Jesus had vanished into the clouds, the disciples still gathered around looking into the sky for Him to return! So two angels came and said “You men of Galilee, why do you stand looking into the sky? This Jesus, who was received up from you into the sky will come back in the same way as you saw him going into the sky.” (Acts 1:11) From there the disciples returned to Jerusalem and waited. They didn’t have to wait long, 10 days, until the Holy Spirit came, filled them and started living within them. And that is what we will look at tomorrow in the next of this series Consequences.